Whether you’re a Christmas dinner novice or a seasoned Christmas cook, creating a truly mouthwatering feast for family and friends can be overwhelming. But it doesn’t need to be! Take a look at our helpful tips and simple timeplan on how to cook a turkey and all the trimmings. Get ahead by making as much as you can in advance and freeze or refrigerate. This could include your stuffing, cranberry sauce, bread sauce, gravy, pigs in blankets and braised red cabbage. 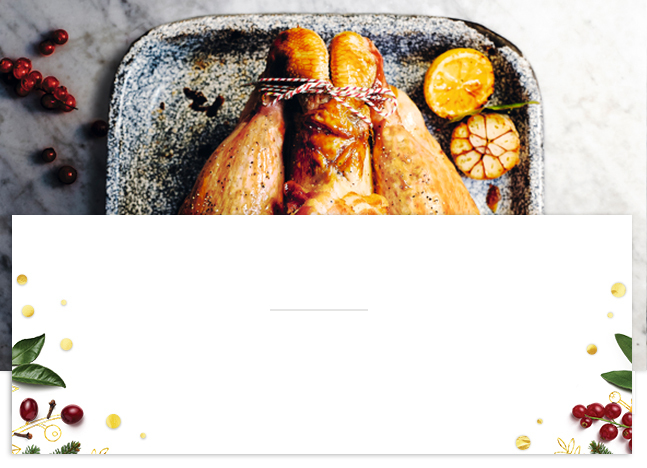 Every Waitrose whole turkey comes with giblets. Remove these from the turkey before cooking but don’t throw away - they make fantastic gravy. See our turkey gravy recipe by clicking through to Recipes at the top. If stuffing the turkey, loosely fill the neck end only so the heat can circulate, and always weigh the bird after it’s been stuffed for accurate cooking times. Check your turkey’s cooking instructions but as a general rule, cook in a 180°C (160°C fan) preheated oven for 35 minutes per kg (including stuffing). Cooking the turkey breast-side down for the first half of the cooking time keeps the lean breast meat succulent. Turn it over halfway through, and baste with the juices occasionally. Make sure to remove the foil for the last 30 minutes or so to allow the skin to turn golden and crisp up. How to test if a turkey is cooked: insert a skewer into the thickest part of the thigh and see if the juices run clear. If there’s any pinkness, return to the oven and check every 15 minutes. Or use a meat thermometer; the temperature needs to read 70°C when inserted into the thickest part of the meat. This is so important to allow the meat to relax and to stay moist and tender. Half an hour is the minimum but the longer the better - up to 11/2 hours. Don’t worry about the turkey going cold, it will stay warm enough to eat plus your hot gravy will heat it up again. Cooking a turkey and all the trimmings this year? Follow these simple steps for an effortless feast. These timings are based on a 4kg whole turkey to serve 6-8 people at approximately 2pm. Check if turkey is cooked, then remove turkey from the oven and transfer to a large board or plate, cover tightly with foil and tea towels to keep warm.